Bitcoin Binary Options – The Easiest Way To Trade Bitcoins? Including a 60 Minute Video with Easy-to-Understand, Step-By-Step Instructions + Bonus PDF Guide! Inside days have a 'lower high' and a 'higher low' than the previous day. These are also generally narrow range bars. In other words, the range of the bar from the high to the low of the bar is relatively narrower (approximately 50% of the range of at least the immediately preceding bar is recommended) than the most recent bar. For the purposes of this strategy we are only using daily charts. For easy identification and abbreviation we identify 'inside days' the same as “Narrow Inside Bar” or NIB's. The objective of this strategy is to accumulate short-term profits on a consistent basis using objective entry and exit criteria. It can be used on any liquid stock on a daily time frame. Historically the strategy has a 84% chance of hitting profit Target #1, a 16% chance of hitting profit Target #2 and a 9% change of hitting profit Target #3. There is a high probability of a profit but there is a risk of loss if the trade does not work as planned. The maximum risk is greater than or equal to the range of the inside day. Risk is managed using stop loss orders. In any stock, identify a recent inside day. As mentioned, inside days (NIB's) have the following characteristics: They have a lower high and a higher low than the previous day. As you can see the 'inside day' has a 'lower high' and a 'higher low' than the previous day which, in this case is a large red bar indicating that the bears were in charge of that day. In addition, the range of the NIB is about 50% or less than the previous day's range. This trade, however, does not depend on the previous day's bar. It can be any color bar and it can have a large real body or short real body. Also, it does not matter if the inside day is a doji or spinning top. In other words it does not matter if it has a real body or no real body. If you're not familiar with these Candlestick terms, it's ok. This method works without that understanding. The only thing that is important is that the day that triggers this trade must have a 'lower high' and a 'higher low' than the previous day and it must be relatively smaller than the previous day's bar in range. We would like to see the 'inside day's' range be 50% or less of the previous bar, but that is a not a strict criteria. It should be tighter in range than the previous bar. 50% of the previous bar's range is ideal, 60% is ok and even trades of 70% of the previous range has the potential to work if the previous day was a relatively small range bar. These are approximations. Simply 'eyeing' the ranges is sufficient for this analysis. By definition, it is an inside day but look at the rather large range of this NIB. It's almost as large as the previous day (which was also a relatively large trading range day), therefore I would not trade this NIB. Although it may present a good opportunity, there are plenty of trades to be found with a higher probability of success. One thing to keep in mind is this: The smaller the inside day is the lower your risk will be. A channel is simply a set of parallel lines that help you visually identify, in this case, the high and low of the NIB. The channel I used below is comprised of 4 lines: (1) the high, (2) a 25% top channel line, (3) the low, and (4) a 25% low channel line. The channel should be drawn as shown: The top of the channel is at the high of the day and the low of the channel is at the lowest point of the bar – the low of the day. Aggressive traders only: Sometimes an early position can be taken in anticipation of a breakout in the area between the 25% channel and the top or low channel line. That's why I have included those lines in my analysis (see video for further details). If the channel lines are a little 'off' that's ok too. The charting programs tend to 'snap' to certain guides. It won't matter, the specific entrance, exit and stop criteria will be exact. Drawing the channel is simply a visual tool to help you identify the setup. The goal of the bulls and bears are to always push prices higher (if you're a bull) or lower (if you're a bear) than the previous day's high or low. When that does not happen, then their power struggle ends in frustration for both sides. Inside days happen when there is a fight between the bulls and the bears. In fact, the strength of the bears and bulls are about equal and neither side gains any ground in pushing the stock higher or lower that's why it ends up as a day that has less of a range of movement than the prior day. So neither side could push the price in the direction they wanted. It creates little movement in either direction. That creates short-term frustration. Usually this power struggle lasts no more than one day. It is EXTREMELY rare to have a NIB followed by another NIB! In fact the odds are extremely low that you would have an inside day followed by another inside day. If you ever see one you might even want to add to your position because the price move could be outstanding! 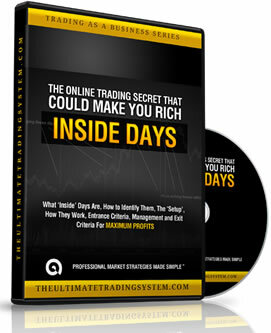 Trading inside days is like trading a shook-up bottle of pop, soda or whatever you like to call sweet carbonated drinks in a bottle. When you shake the bottle and you twist off the cap, it will explode! Those who wanted to push the prices higher or lower will try again the next day and usually one side will overpower the other and win. It's like a tug-of-rope...eventually one side dominates. For example, if the bulls outnumber the bears then on the following day prices will go higher. And, conversely, if the bears outnumber the bulls then on the following day then prices will go lower. That's how we profit. We simply take the side of the group that has the most power to push prices in their direction! Specific criteria in the sections below will help you stay out of trouble and minimize losses. The entry criteria could not be easier however I DO NOT recommend placing this trade just prior to an earnings announcement. Since you'll only be in the trade a few days – 4 at most – you can plan accordingly. Immediately after your order is filled on either side set your STOP LOSS. I do not suggest using 'mental stops' even if you can watch the market all day.